Father Gregory Polan, 66, until now, Abbot of Conception Abbey, has been elected the 10th Abbot Primate, succeeding Abbot Notker Wolf who has served in the position of Abbot Primate since being elected by the Congress of Abbots on 7 September 2000. Abbot Gregory has been the 9th Abbot of Conception since November 6, 1996. He was professed in 1971 and ordained in 1977. He is a native of Berwyn, Illinois. Abbot Gregory is the second abbot of Conception Abbey to be elected Abbot Primate. Abbot Marcel Rooney was the 8th Primate having been elected on September 18, 1996 and resigned on 3 September 2000. 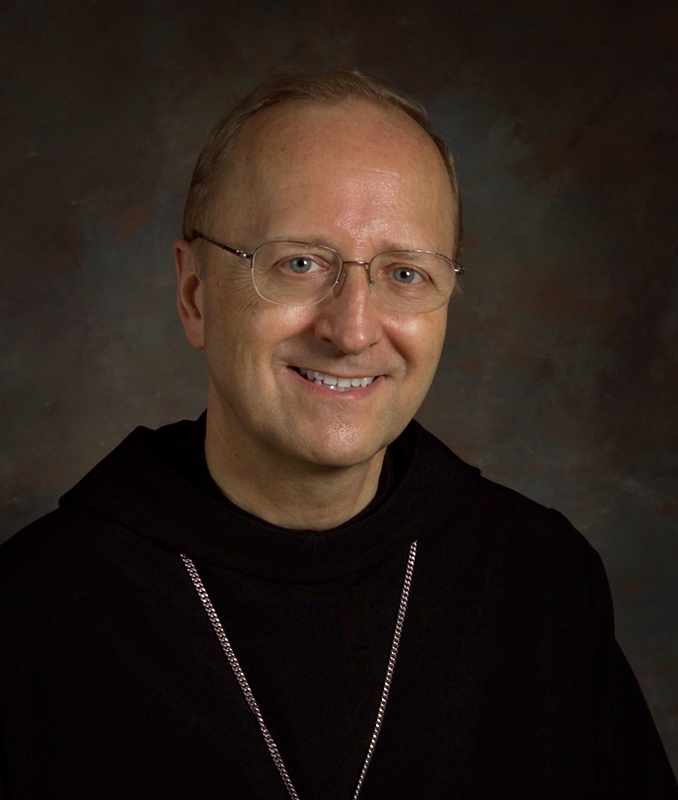 Abbot Gregory is the fourth American to be elected to the Office of Abbot Primate. The others were Dom Rembert Weakland (now retired archbishop of Milwaukee); the late Abbot Jerome Theisen, and Abbot Marcel Rooney. Abbot Notker was born on 21 June 1940, professed a monk of the Archabbey of St. Ottlien in 1962, ordained in 1968, elected Archabbot of his community in 1977, elected Abbas primas and Abbot of Sant’Anselmo 7 September 2000. He served three terms. In the decree Inæstimabilis unitatis (16 September 1894) of Pope Leo XIII, gave the office of abbot primate to the Benedictines. The Primate has no direct authority the vast number of Benedictine houses (but there are Benedictine monasteries he is responsible for). There are approximately 7000 Benedictine monks. Polan becomes the abbot of the monastery Sant’ Anselmo. As THE Benedictine leader, he is the point of communio for the worldwide Benedictine Confederation and he who works as the primary liaison with the Holy See. Abbot Gregory is recognized as being a pastoral abbot and spiritual leader and well regarded across various sectors. Professionally, he is a scholar of Sacred Scripture and has the skills of a musician. Under his leadership a new English translation of the Book of Psalms that has been adopted by the US Catholic Bishops and Rome as the translation that’s used in the Liturgy. [Zenit] Pope Francis today received in audience some 250 participants in the congress of Benedictine abbots and abbesses gathered in Rome to reflect on the monastic charism received from St. Benedict and their faithfulness to it in a changing world. This theme acquires special meaning in the context of the Jubilee of Mercy since, as Francis affirmed, “if it is only in the contemplation of Jesus Christ that we perceive the merciful face of the Father, monastic life constitutes a privileged route to achieve this contemplative experience and to translate it into personal and community witness”. 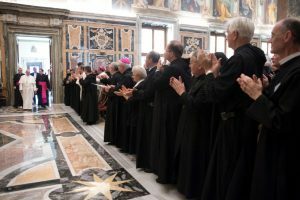 With the grace of God and seeking to live mercifully in their communities, monks and nuns “announce evangelical fraternity from all their monasteries spread out in every corner of the globe, and they do so with that purposeful and eloquent silence that lets God speak out in the deafening and distracted life of the world”. Therefore, although they live separated from the world, their cloistered life “is not barren: on the contrary, an enrichment and not an obstacle to communion”. Their work, in harmony with prayer, enables them to participate in God’s creative work and shows their “solidarity with the poor who cannot live without work”. Their hospitality allows them to encounter the hearts of the “most lost and distant, of those who are in a condition of grave human and spiritual poverty”, and their commitment to the formation of the young is highly appreciated. “Students in your schools, through study and your witness of life, can too become experts in that humanity that emanates from the Benedictine Rule. Your contemplative life is also a privileged channel for nurturing communion with the brothers of the Oriental Churches”. 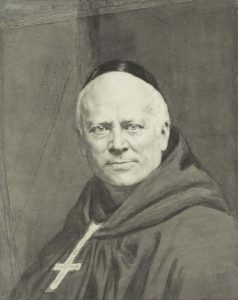 “Your service to the Church is very valuable”, he concluded, expressing his hope that the Congress may strengthen the Federation so that it is increasingly at the service of communion and cooperation between monasteries and urging the Benedictines not to be discouraged if their members age or diminish in number. “On the contrary”, he emphasised, “conserve the zeal of your witness, even in those countries that are most difficult today, with faithfulness to your charism and the courage to found new communities”. I always look forward, for some reason, to the feast day of Saint Bernard of Clairvaux. Not sure why, but it may have something to do with marking the progress of the summer (just like the Transfiguration and the Assumption does) but also because his youthful calling to serve God in a profound way is a true inspiration. The historians tell us that Bernard, at 22, together with his four brothers, and 25 friends, joined the relatively new abbey of Citeaux; we also know that his father and another brother joined him. Early in his monastic life he was called upon to be an abbot founding the Abbey of Clairvaux. In time, his abbey had over 700 monks with 160 daughter houses. Bernard was the one to give the Cistercian reform of Benedictine monasticism its vitality. His doctrine was clear and straight-forward. His sermons were of the highest quality. His pastoral work included fighting the Albigensian heresy, helping the Second Crusade, ending the schism of anti-Pope Anacletus II, and teaching monks among whom was the future Blessed Pope Eugene III. Bernard was an ardent lover of the Blessed Virgin Mary and called himself “Beatae Mariae cappellane” – the Blessed Virgin Mary’s Chaplain. Love is sufficient of itself, it gives pleasure by itself and because of itself. It is its own merit, its own reward. Love looks for no cause outside itself, no effect beyond itself. Its profit lies in its practice. I love because I love, I love that I may love. Love is a great thing so long as it continually returns to its fountainhead, flows back to its source, always drawing from there the water which constantly replenishes it. Of all the movements, sensations and feelings of the soul, love is the only one in which the creature can respond to the Creator and make some sort of similar return however unequal though it be. For when God loves, all he desires is to be loved in return; the sole purpose of his love is to be loved, in the knowledge that those who love him are made happy by their love of him. The Bridegroom’s love, or rather the love which is the Bridegroom, asks in return nothing but faithful love. Let the beloved, then, love in return. Should not a bride love, and above all, Love’s bride? Could it be that Love not be loved? Rightly then does she give up all other feelings and give herself wholly to love alone; in giving love back, all she can do is to respond to love. And when she has poured out her whole being in love, what is that in comparison with the unceasing torrent of that original source? Clearly, lover and Love, soul and Word, bride and Bridegroom, creature and Creator do not flow with the same volume; one might as well equate a thirsty man with the fountain. What then of the bride’s hope, her aching desire, her passionate love, her confident assurance? Is all this to wilt just because she cannot match stride for stride with her giant, any more than she can vie with honey for sweetness, rival the lamb for gentleness, show herself as white as the lily, burn as bright as the sun, be equal in love with him who is Love? No. It is true that the creature loves less because she is less. But if she loves with her whole being, nothing is lacking where everything is given. To love so ardently then is to share the marriage bond; she cannot love so much and not be totally loved, and it is in the perfect union of two hearts that complete and total marriage consists. Or are we to doubt that the soul is loved by the Word first and with a greater love? 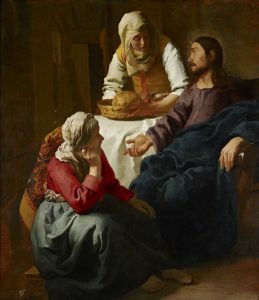 Today, on the Novus Ordo liturgical calendar the Church recalls St Martha. For Benedictines, today we seek the help of Saints Martha, Mary and Lazarus, Hosts of the Lord. All three are not only disciples of the Lord but are true friends. In the Benedictine tradition Saints Martha, Mary and Lazarus are venerated as living Saint Benedict’s mandate of hospitality: “Let all guests be received as Christ, for He will one day say, I came as a guest and you welcomed me.” (RSB 53:1). For this reason, one Benedictine Lectionary proposes the story of Abraham and Sarah extending hospitality. In a time when hospitality is not a value, the Benedictine tradition gives us this feast of Saints Martha, Mary, and Lazarus to keep our hearts focussed on the practice hospitality. “Behold,” says the Lord, “I stand at the door and knock; if any one hears my voice and opens the door, I will come in to him and eat with him and he with me” (Rev. 3:20). What we see in these saints we see first in the Eucharistic hospitality of God at the altar. Just as Martha, Mary and Lazarus opened the door to Jesus and made room for him, there is room for all of us at the temple of God where we are invited in to hear the Word and receive his gifts of Life. May we learn what it means to be hospitable. Can we sit at the foot of the Master like Mary at the Eucharistic banquet and receive his mystical body and blood, or be a penitent like Lazarus or to set aside the anxieties of this world? Can we leave the anxieties of life to bring our entire humanity to the Lord through the transparency of prayer? The re-founder of Benedictine life in France in the 19th century, Dom Prosper Guéranger (1805-1875) has a cause introduced (2005) for study for possible sainthood. While no one is perfect in this world, there is reason to believe that God has made a saint of his monastic servant. The ideas and works point in a certain direction of the quality of the person being proposed for study but these things do not completely identify the person. I chose this date to introduce the invitation to pray for the beatification of Guéranger because it is the date on which the newly formed Benedictines professed their solemn vows at Abbey of Saint Paul outside the Walls in Rome in 1837. God our Father, your servant Dom Prosper Guéranger, Abbot of Solesmes, guided by the Holy Spirit, helped a multitude of your faithful people rediscover the meaning of the liturgy as the source of true Christian life. May his devotion to your Holy Church and his filial love for the Immaculate Virgin, inspired by the mystery of the Incarnate Word, be a light for Christians of our own day. Deign, O Lord, to grant the favour we ask you by his intercession, so that his sanctity may be recognized by all and that the Church may soon allow us to invoke him as the one of your blessed and one of your saints. Through Jesus Christ, Our Lord. Amen.